When you're a renovator, and especially a renovator in old homes, sooner or later you will come to a point where you need to fill a void where regular old wood filler just won't cut it. 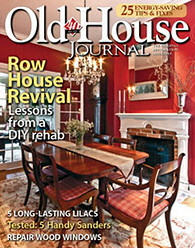 Whether you encounter a gap that is just a little too wide, need to fix something that has had the corner broken off of it, run into an old door knob hole or lock mortise that needs to go away, or find an old hinge mortise location that must disappear, there comes a point where regular old wood filler would just sag, crack, or shrink and fall out. The areas where a good quality two part wood epoxy is necessary are just too numerous to list. In our projects the need for a good quality wood filler came up early and has continued to come up quite often over the years. I found a great product for this many years ago and have stuck with it through thick and thin as my epoxy wood filler of choice. I've filled doors, windows, molding, furniture, siding, dings, cuts, gouges, dings, and just about anything larger than a simple finish nail hole. Though it says it doesn't shrink, it's been known to lie. "What is this miracle product" you ask? Well, I'll tell you, it's Abatron WoodEpox. While it may not quite be a miracle, it sure isn't your run of the mill wood putty. In all of my uses for it, WoodEpox has thoroughly served my needs on any project I've used it on. I first learned of this wood epoxy from Abatron's advertisement in Old House Journal magazine back in 2003. The project window they were restoring looked to be in similar shape (from a rot perspective) to one of ours, so I figured it was worth a shot. This was long before I even realized the benefits of a two part epoxy and that not all wood fillers were created equal. If you're reading this and you don't yet know the difference, it's time to learn. A normal wood filler is made of a mixture wood particles and essentially a glue, but is water based. The evaporation of the water is what allows the wood filer to dry hard, but the problem is the water evaporation process also allows the wood filler to shrink and crack as it dries. This can also allow your filler or patch to fail and fall out of where you placed it. Two part epoxy, on the other hand, consists of two chemical compounds that are stable on their own, but activate when combined and thoroughly mixed. This activation of the two chemicals is what causes the epoxy to harden. What you're left with is a shrink free, sturdy, and predictable filled application that won't fail and can span large gaps. If you place an order for the Abatron WoodEpox, you'll receive two same size tubs of part A and part B of the WoodEpox. One part has a dark tan color to it, and the other a bright white color. Abatron marks one lid with a red dot so you can easily identify which is which without opening the container. Applying and working with WoodEpox is quite easy and straight forward. You'll need to wear latex gloves (this stuff can be seriously sticky), but otherwise nothing too special is required. Just open the two containers and pull out equal sized lumps in either gloved hand. Make sure you don't put the gloved you pulled the first lump out into the second container. If you do, you're just asking for problems. Once you have your two lumps, just mash them together in one of your hands. Begin to knead the two lumps together to fully combine them. You will see the two distinct colors slowly turn to a mild tan color. Keep kneading to be sure you've fully mixed everything together until the color is completely consistent. The final step is to apply the WoodEpox to the area or areas you are trying to fill. I make sure I make a little over what I think I will need because it is much better to overfill the void than underfill. No matter how what, you can always take material away after it dries. 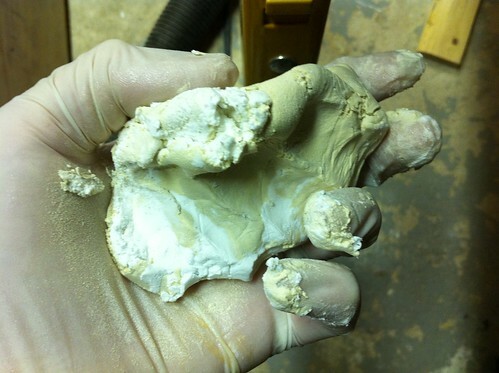 Just work the epoxy in with your fingers and get it roughly to the shape you need it to be. After allowing about a 24-48 hour cure time (depending on thickness and weather), the epoxy is ready to be sanded, cut, or otherwise shaped. Don't try to do it too soon or it will just gum up your sanding discs and might just pull free from the work. But as the website says, only fully cured Abatron WoodEpox can be "painted, stained, wood-grained, sawed, nailed, planed, sanded, carved, and machined like wood." In the photo below you can see how nice and smooth I was able to sand the filled hinge mortise location. That hing location was over-drilled and badly rotted, now it's as good as new. 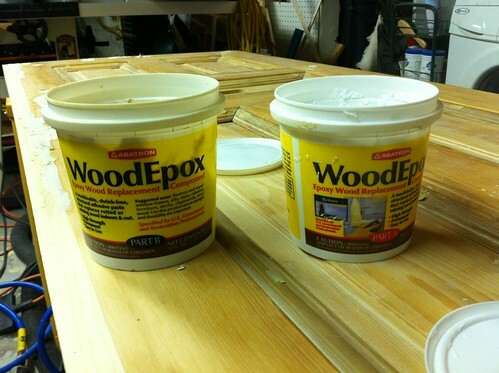 I had a situation a few years ago where I had to use another brand of two part epoxy because I ran out of the WoodEpox and was in a time sensitive bind. The stuff I used in its place smelled horrible (we had to leave the house while it dried), was hard to sand, and still doesn't quite look like it should today. I learned my lesson and will make sure I stick with the stuff I know from this point forward. I even used the Abatron WoodEpox to fix the baseboards over our neighbor's house after she watched Ollie and he decided to snack on a few baseboard corners. After I sanded and painted them, she said they were the best looking baseboard corner in her house. If you're looking for a good quality two part wood epoxy to use in your projects, look no further than Abatron's WoodEpox. It should serve your needs for years to come. 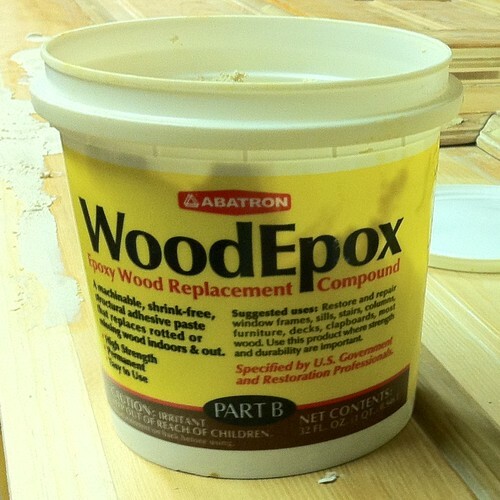 And if you are fixing something that has really rotted away, Abatron has companion products that work with WoodEpox that will also harden up the soft and rotted wood. I've had OK luck with the Elmer's ProBond, but then I haven't pushed its capabilities very hard. 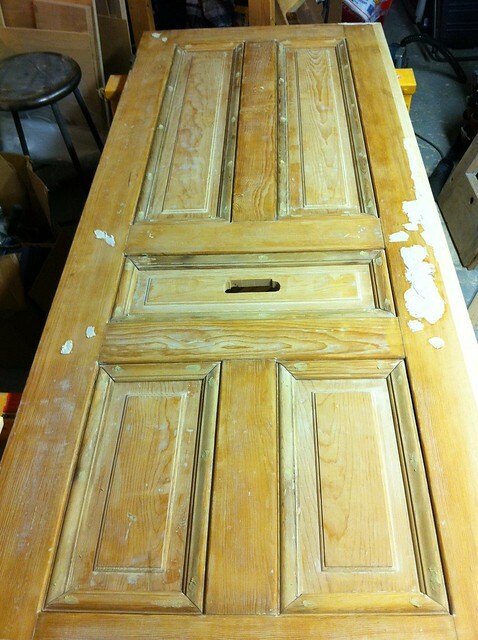 Just for very shallow nicks/dents in an interior door I stripped and re-painted. A professional cabinet maker relative of mine who was doing some work on my house tsk-tsk'd me for using that stuff and said I should use bondo... Yes, the automotive stuff. He said it's stable, sand-able and doesn't shrink. I used the bondo once, but it does leave something to be desired. I do like the WoodEpox much better. Bondo isn't a good choice for exterior repairs. 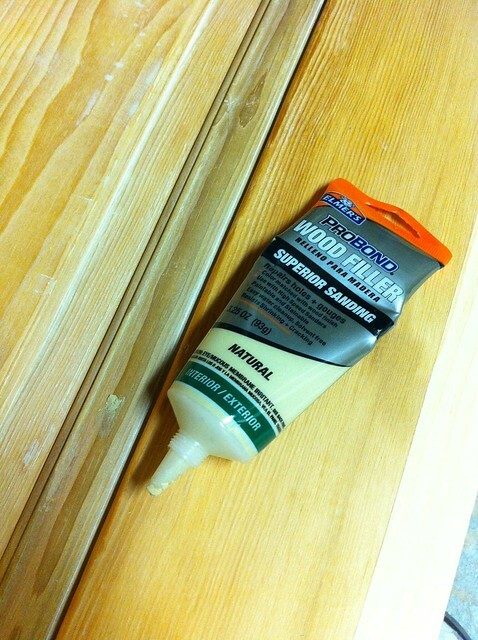 Wood expands and contacts with humidity and the seasons, but bondo doesn't. Eventually the expansion and contraction will loosen the bond between the bondo and the wood. 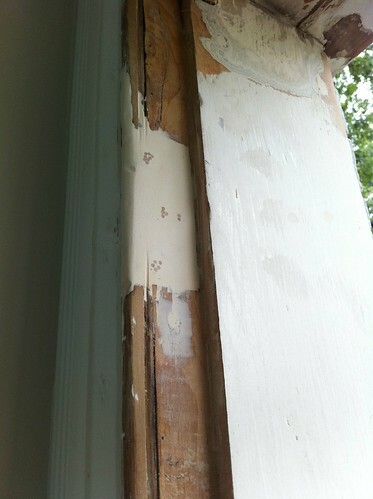 The problem accelerates once water gets between the bondo and wood. Worse case you actually accelerate your rot conditions. Lots of people like bondo because it sets up fast. You don't need to wait 24-48 hours like you do with 2-part epoxies. But the epoxies move with the wood so never have the failures of bondo. Bondo will last longer for interior repairs, but exterior repairs will fail in a couple of years. Brendan, you are 100% correct. 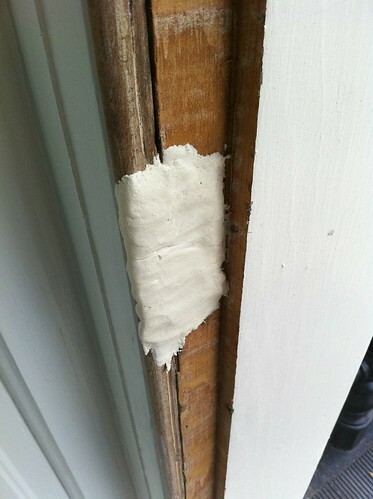 Someone suggested bondo to fill nail heads on the siding we installed years ago. We were in a time pinch and I didn't want to wait 24 hours for the epoxy to cure. Luckily, my conscience won out and I ended up using the epoxy and slightly delaying the paint job. After I learned of the potential problems associated with bondo and outdoor use, I was so glad I couldn't let myself take the short cut. Now five years later the siding still looks great. I tried this Abatron product after seeing your's and others' positive reviews online. I had a large area of fascia rotted away where the it meets a brick chimney two stories up, so not easy to replace the wood and an awkward place to do any kind of work. I bought their kit that has a quart each of part A & B consolidator, part A & B epoxy, and a cleaner. It took two softball size wads of putty to fill the holes. I thought it was easy to work with and apply. The next day I primed, then painted it. We'll see how it holds up. Looking for a glue/ epoxy that can fill a 1/8 diam hole in wood drum sticks and not break.. Looking for a filler for small holes in wood. Must be strong.. I know the epoxy we wrote about will fill the holes, but I'm not sure exactly how string the actual patch will be. The epoxy patch is light weight, but pretty sturdy. If it's in drum sticks, I really am not sure how it will react to continued use. Sorry I can't be of more help. We have a structural 4x6x20' cedar column that has rotted at the bottom leaving a void approx. 1/3 the col. thickness. Will the epoxy install structural integrity to the column. It's a corner column of a two story deck and would be extremely expensive to replace. Thank goodness for your blog! I too live in OT and while I can't do most of the repair work, I do try to do some. Anyhow, had workers repair my window sill, don't know what filler they used but it shrunk, so they will be returning to fix the problem.This time they will use Abatron WoodEpox. Question, how well does the product keep once opened? I'm debating on which size to purchase because there could be a lag between usage. Thanks! Hi TM - We're so glad you found us too. Abatron keeps for quite a while as long as you combine the parts. I think we've had ours for over 2 years and it's still usable. Good luck! Like your sight. Hope woodpox works on large area. I filled a 15x3" roof line rotted board easily with this product after I had "painted" the Liquid Wood product everywhere I could access. It set up nicely and though I havent gone back and sanded/painted the area it has held up remarkably well. I need to repair a chair that has rotted away in a corner where 4 dowels meet. 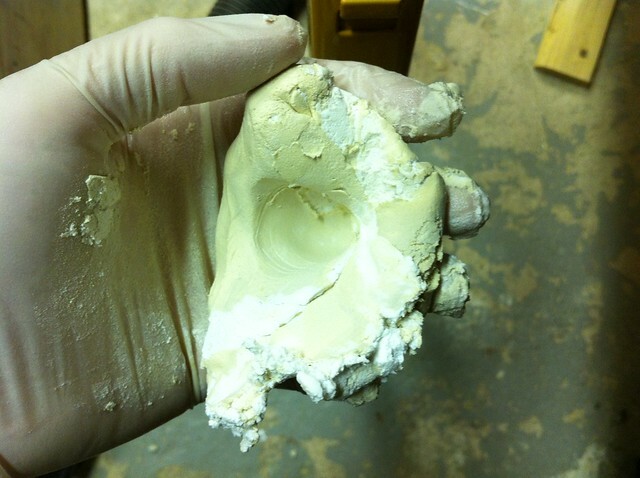 If I remove the rot and rebuild it with this putty, is it strong enough to drill 1/4" dowel holes? I guess I'm asking if the dried product is stronger than, say, pine.